This post is brought to you by the new Samsung 4-Door Sparkling Water Refrigerator. Still or sparkling? Now get both straight from your refrigerator door! Store up to 31 bags of groceries with 31 cu. ft. capacity and keep fruits and vegetable fresher longer with Twin Cooling Plus®. Click here to learn more about the Samsung 4-Door Sparkling Water Refrigerator. 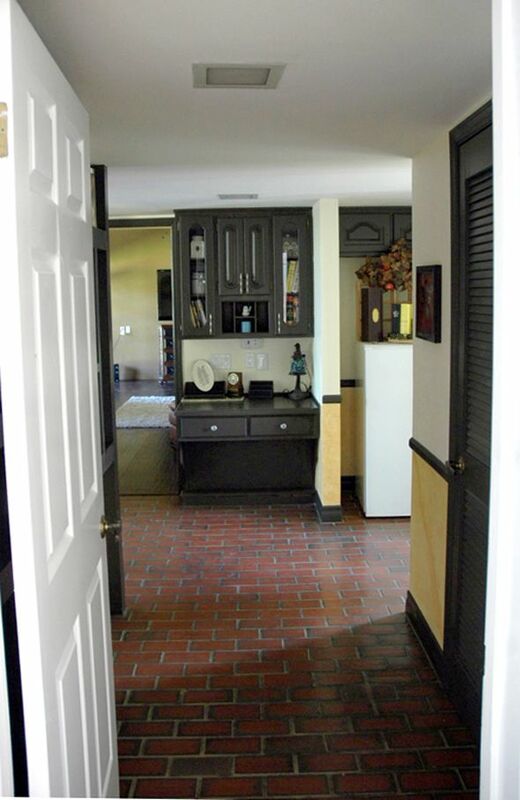 Remember that fab Samsung refrigerator we talked about here? The one that has a sparkling water dispenser built in? Well, Samsung is hosting an Instagram sweepstakes and the prize is one of these refrigerators! They asked me to participate by sharing a space styled in my home two ways: still and sparkling. I had a great time putting this together! Since we didn't have any of our furniture yet when I took these photos, I decided to use my little desk area in our kitchen. 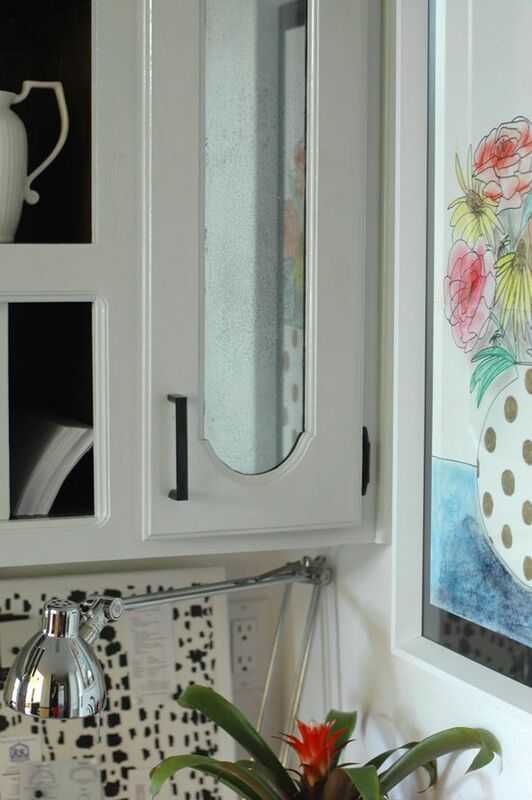 Here's the kitchen tour if you need a refresher. 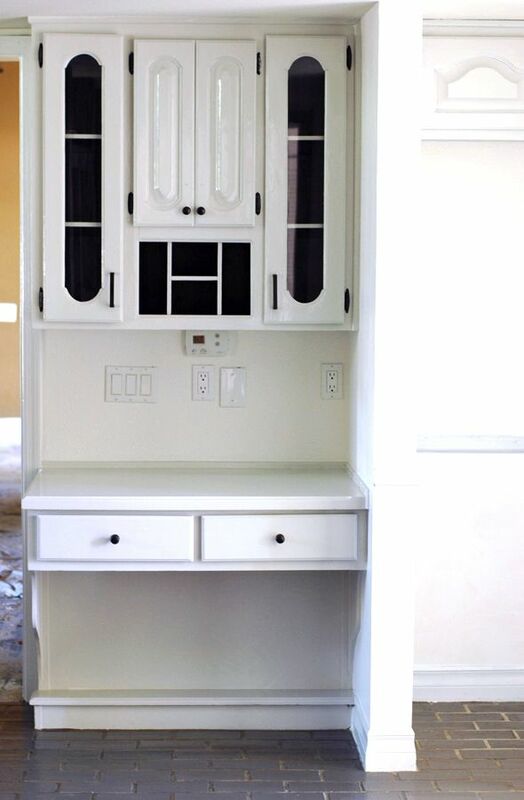 Before I started collecting accessories and lamps for styling, everything in here got a fresh coat of paint, including the walls, cabinets and floors. I found two chairs at Goodwill as a starting point and then we were off! I decided for the 'still' space I would go for a sort of West Elm look - a little more modern and a little organic. Still colorful, but plenty of neutrals thrown in for good measure. Lots of wood, natural fibers and matte textures. 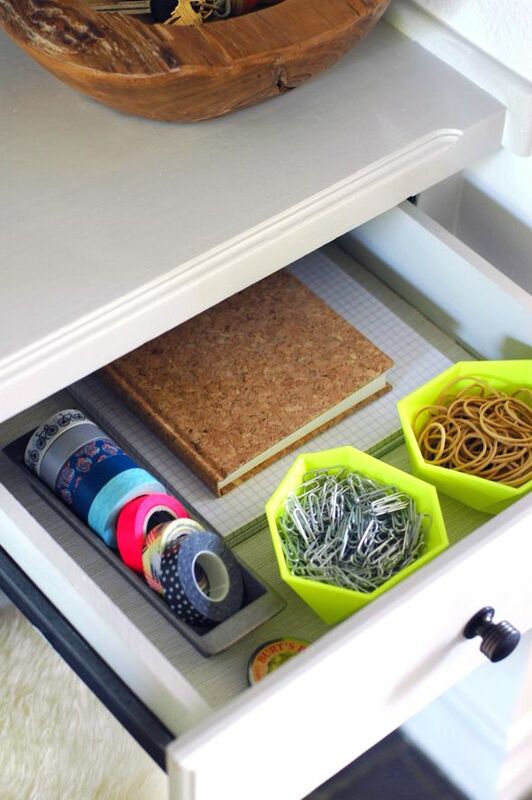 I lined the drawers of my desk with woven place mats from IKEA (which randomly fit perfectly in my drawers!) so that my little bowls of office supplies wouldn't slide around. That cork board was a lucky find. It was just the right size to cover up one of the two (?) electrical outlets and a junction box, but not so tall that it covered up the thermostat all the way. I painted it white so it would blend in with the walls. I bought some new hardware from Lowes and spray painted it oil-rubbed bronze, which I like against white painted cabinets and doors. I think the contrast is so pretty. 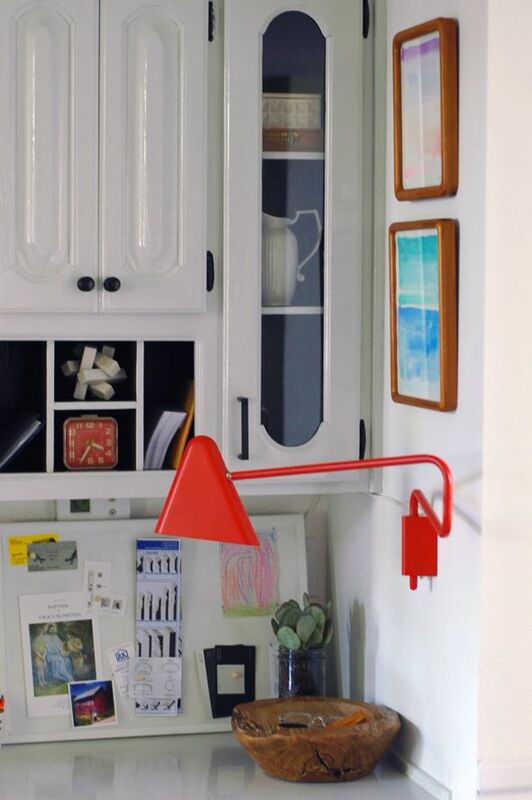 The red powder coated wall sconce is also from IKEA. 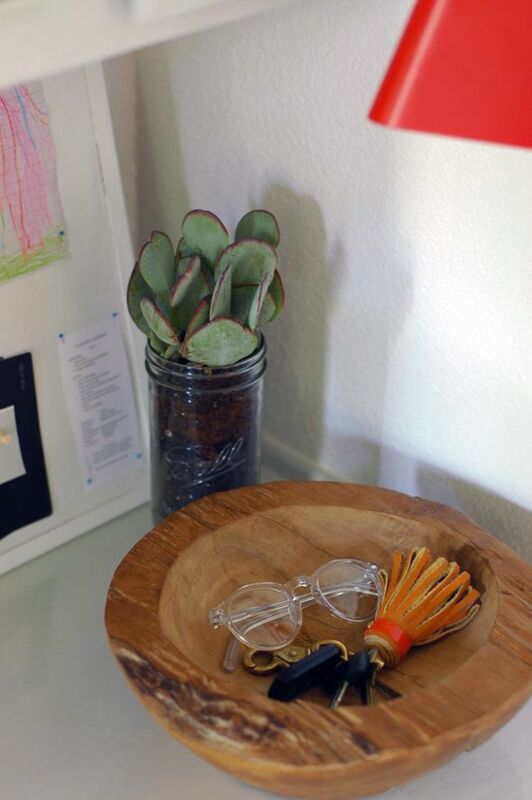 The wooden frames were thrifted. I love the rounded corners! 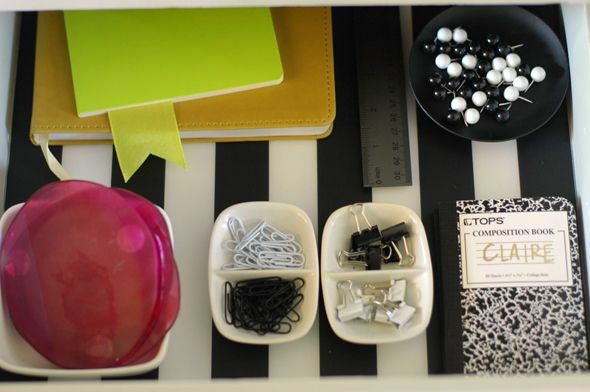 For the 'sparkling' version of the desk space I went a little more preppy - sort of a Kate Spade look. I was going to spray the hardware again but brass this time, but I decided I liked the oil-rubbed bronze and opted to keep it for now. I love all the shiny surfaces in the sparkle version! 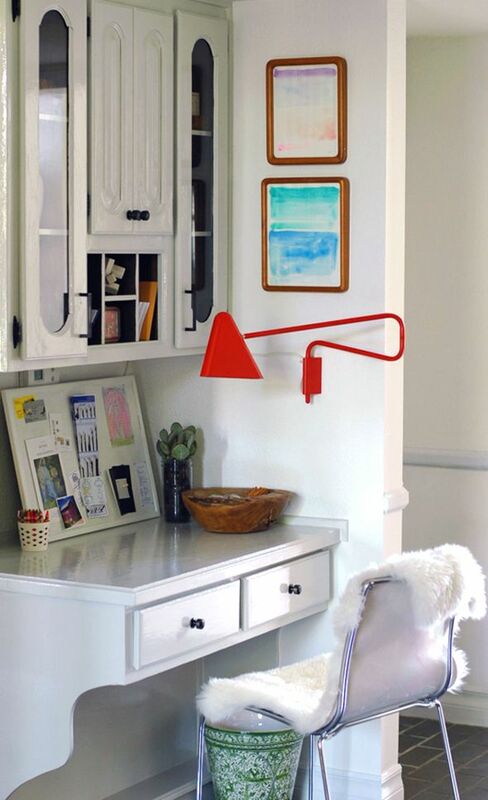 This little nook seriously packs a big punch! 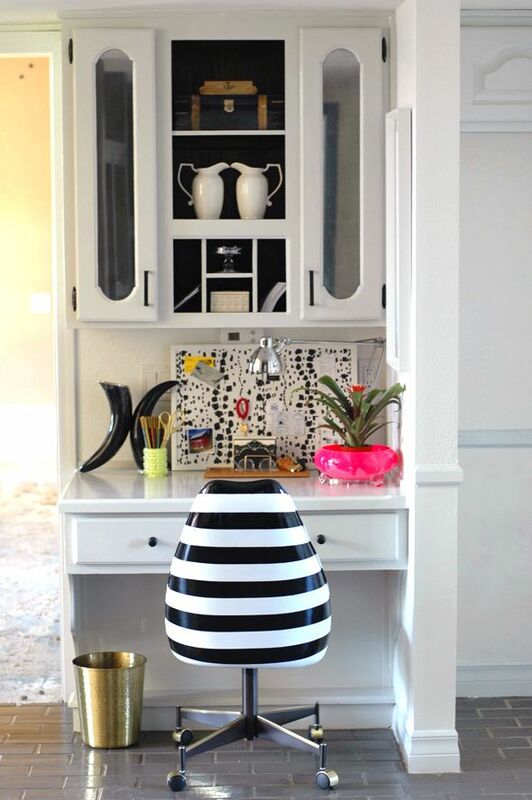 So, friends, which version of my kitchen desk is your favorite? Are you on team #samsungstill or #samsungsparkling? To enter the give away for the Samsung sparkling water dispenser refrigerator, post an image on instagram that shares your best case for being on team sparkling or team still. Here are the details on the contest. Best of luck! This post was brought to you by Samsung. Click here to learn more about the Samsung 4-Door Sparkling Water Refrigerator. Thanks for supporting LGN sponsors! sparkling to the max! did you diy that chair at all? or did it just come like that? very cool spaces, both of them. i love all the little details. I love, love, love both. But personally, Sparkling looks phenomenal to me! That chair is just to die for! Details are off the chain! You are so talented!! team sparkling! 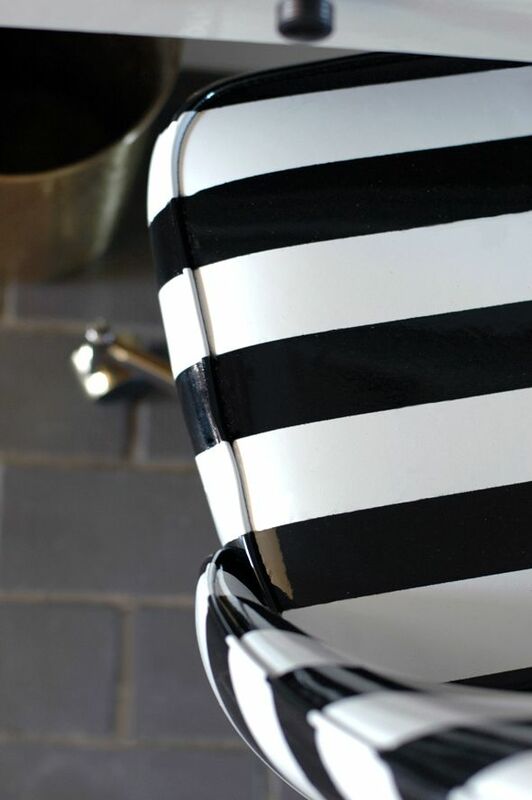 love all the black and white! Sparkling, sparkling, sparrrrrrkling! Get's my vote. 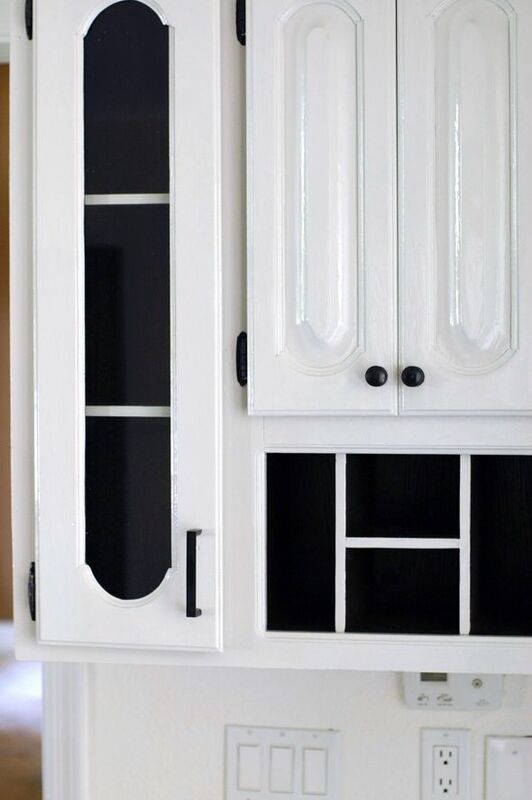 I love the upper middle cabinet style so much more as well! 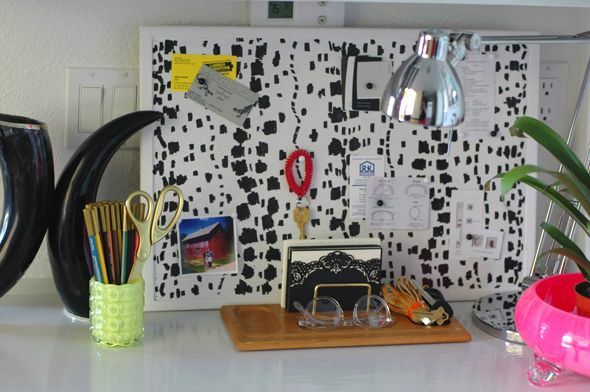 The sparkling--how did you do the black and white bulletin board? Paper? I want to do a mashup of the two spaces! 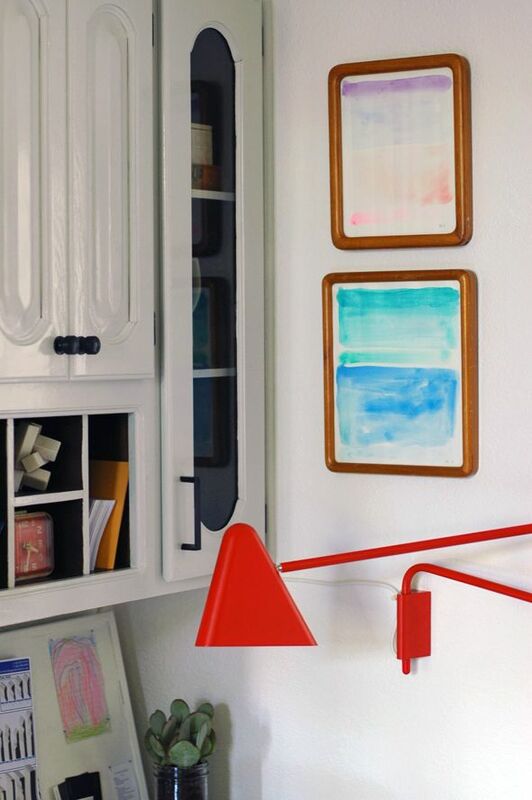 How about moving the Ikea lamp, drawer accessories, and art from still to sparkling? 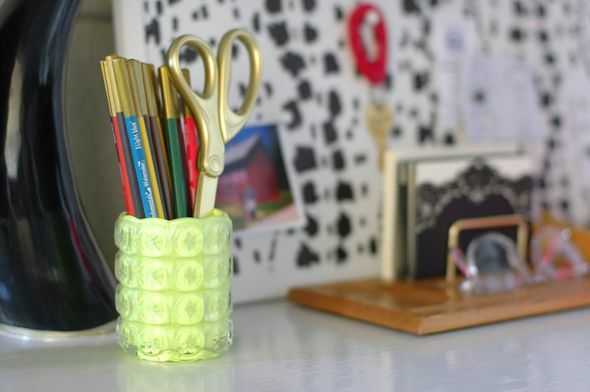 That would be a perfect for me desk space! I love the sparkling chair, but I think I prefer the still styling. I think it's all the natural elements that draw me in. I love them both! Don't tell me you found that black and white chair at the thrift store like that? It's so freakin cute! Amazing Jenny! Both of these are so good - tell me you have some help! Sparkling love - Did you paint the chair and bulletin board in the sparkling version? How do you get all this done?! You are a machine! I like the upper cabinet look from the Sparkling design (mirrored cabinet doors and open shelving in the middle) combined with the Still look. So, a little of both! 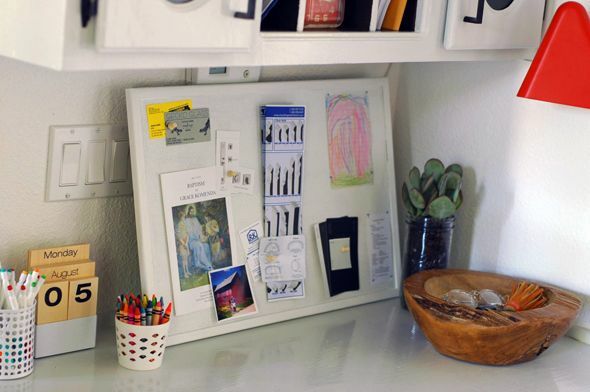 Would love to know how you dotted the cork board. Also, where did you find the flower print in the sparkling space? Love it! Team sparkling!! Love everything about it!! Team Sparkling all the way! 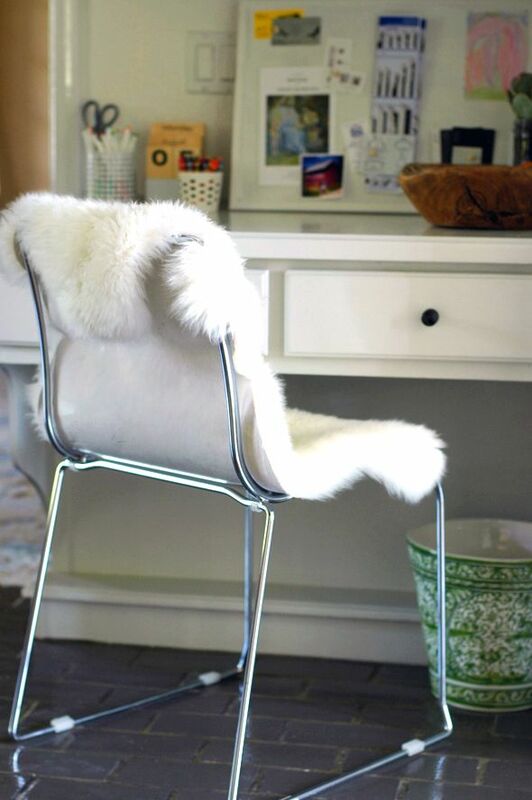 That chair is so fab, where did you find it? God both are *perfect*. The "still" one is probably more me, but I love the crazyness of the "sparkling one". With your talent, do you even need furniture? I really have to choose?! There are elements of both that I love...but I guess I am Team Sparkling. That chair really pops! I would be so thrilled to spot that at the thrift store. At first glance I'd say team sparkle but after reading the post and thinking about it I am team STILL!!! These are both really great! I'm seriously blown away at how fast you're getting things done! I'd love to know if you're team sparkle or still too!! 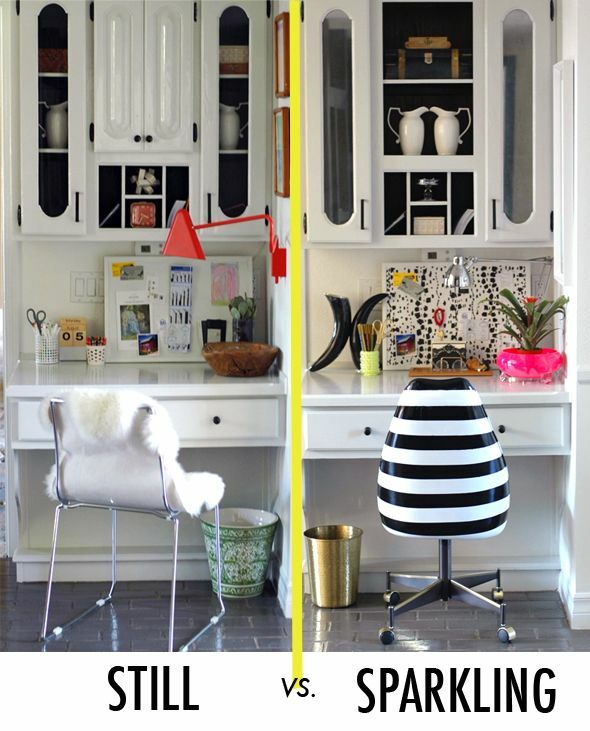 Love both but that chair on the sparkle desk tips the scales. Did you paint it or find it that way? I seriously want to do paint one but I'm concerned about it holding up. What are your thoughts? It's official. I'm moving to Arizona so I can shop at your Goodwill! Love both versions, but Sparkling is more me! 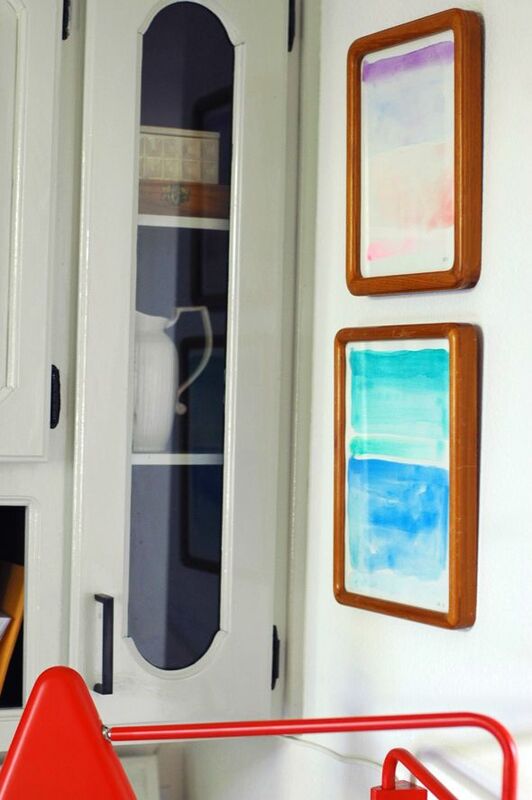 I want to know details about that chair and also what paint you used to paint your cabinets. It is your fave oilbase white paint? I'm sure you'll post on all of that, but I'm excited to know! Who can choose? They are both darling! 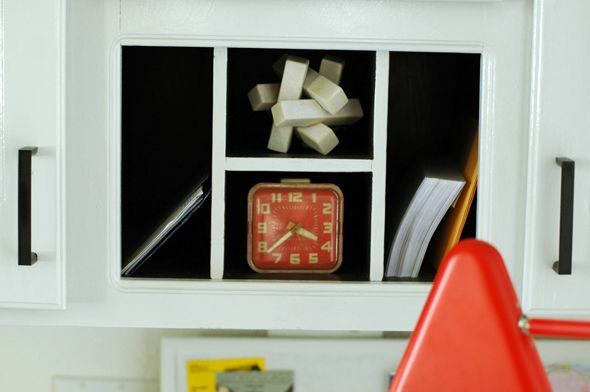 Ikea placemats for drawers? Genius! I've just needed an excuse to grab some of those. 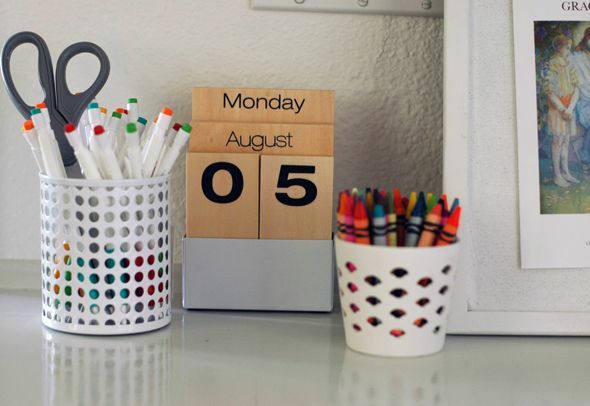 I was just reading Friday that the little desk space is becoming a dated trend but I disagree! If anything, we need them more than ever as a place to charge everything before we run out the door for the day and keep the laptop. I love your space and how you dressed it. I love the Sparkle! Did you seriously find that chair in a thrift store?! 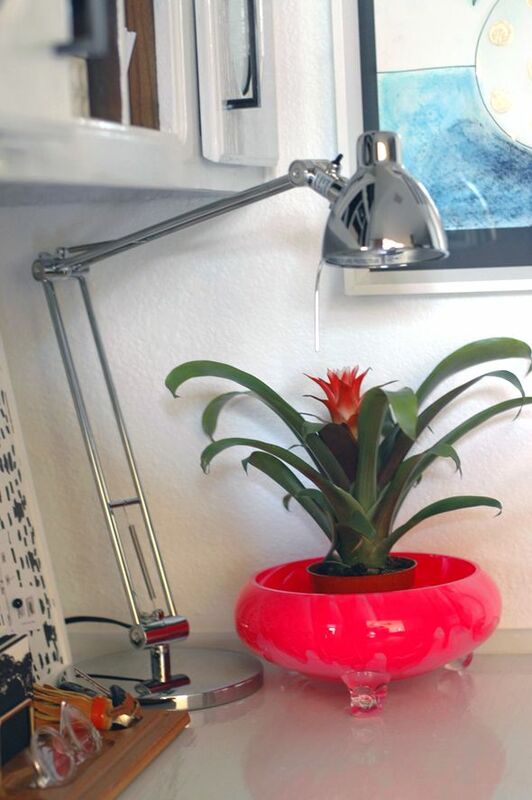 Also where is the hot pink footed bowl from? Love!!!! TEAM SPARKLING ALL THE WAY! Sparkling is just so good! They both are beautiful, but sparkling wins my vote. LOVE both, but definitely team sparkle!! That chair is AMAZING!! 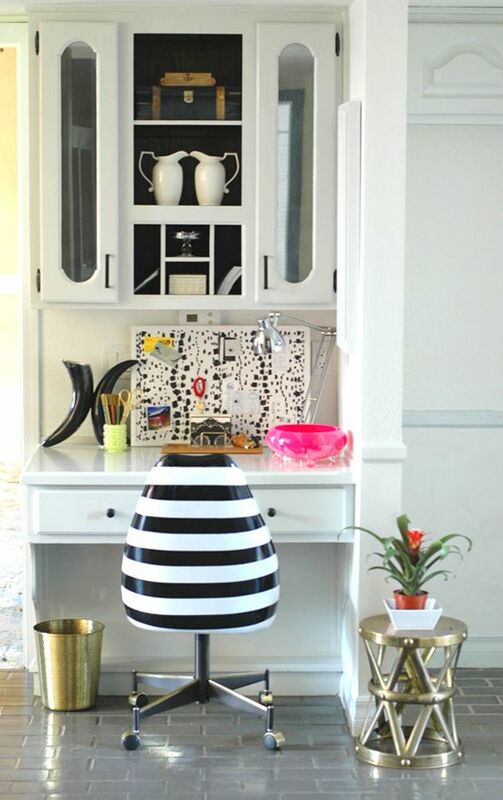 I LOVE Kate Spade and am using her for inspiration for my office. I am in love with that chair, too! I'm really hoping it's not a thrift store find and I can get one for my self! Sparkle! Obsessed with that chair! Team sparkle for me! Love the dotted cork board--hope you provide details there--the chair of course and the pop of pink! After touring your new house I am sure I would feel like running away as it is going to be a large project! YOU have the vision that I just don't have! Sparkle please! I know you are very talented-I cannot wait to see it when you get done with it. So happy to hear the gingerbread is going away! Both spaces are awesome. My personal taste would probably lean toward still, but I think you pull off the sparkle well! heads up for readers - Samsung appliances are not well made and their customer service is a mess. Our fridge broke five weeks ago and they STILL have not sent someone to fix it. Two of my friends have had the same problem with their service. It's a shame, because this new fridge looks awesome! 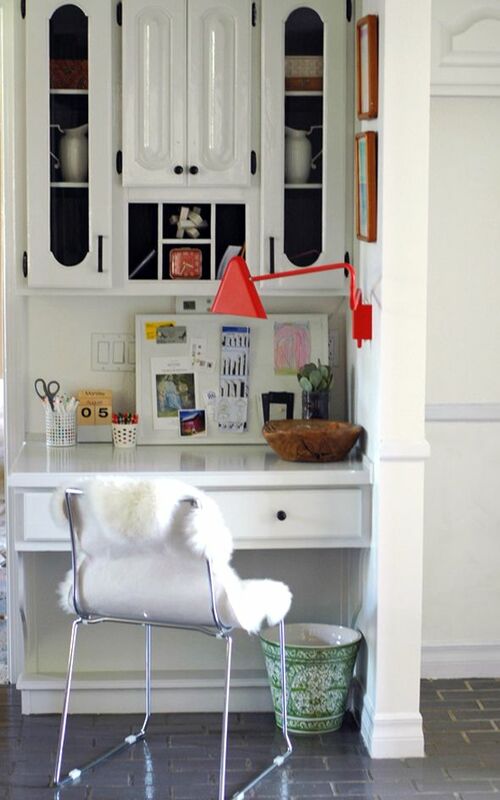 I like the still chair, the sparkling cabinets, the sparkling drawer liner, and the still desktop. I adore the Sparkle! It's fantastic! 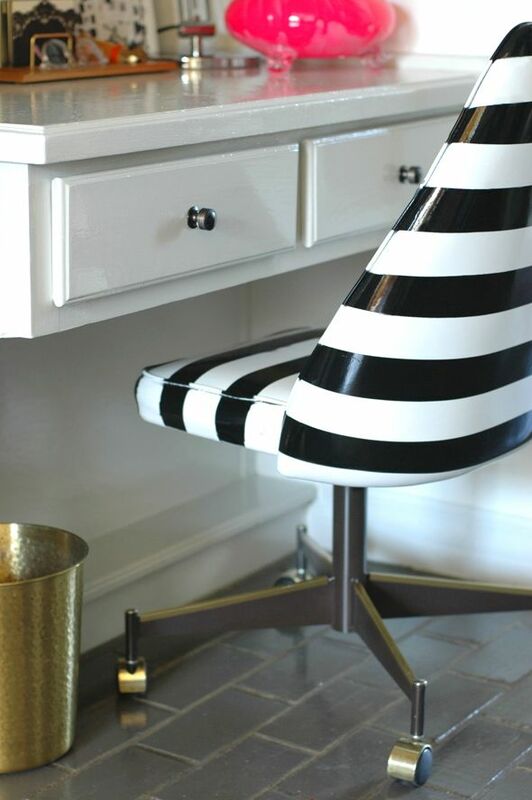 That striped chair is fantastic. No way you thriftier that as is. SPARKLING! I just love everything about it and I love sparkling water. The chair is so cool with the pink pop of color, just perfect. Great job as always. i'm going to have to agree with the majority and go with sparkling! wow, lady, you are pretty amazing! both looks are fantastic! i'd love to know some more info and sources, like the striped chair: did you paint that yourself? where is the hot pink bowl from? you must have a really great goodwill to get chairs like that there! such a beautiful job, jenny! Both are fantastic, but I think I like the sparkle a bit more. 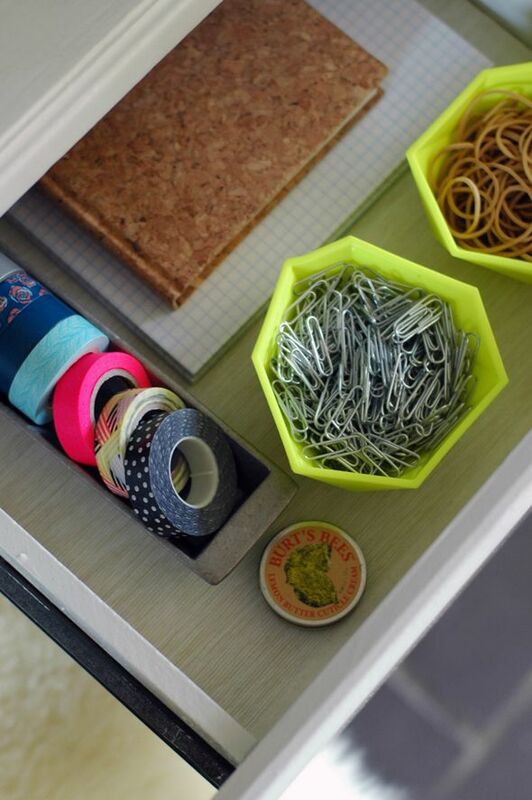 I would love to know where you got the neon geo drawer containers and the pink planter. Well done Jenny! I'm a sparkle girl! 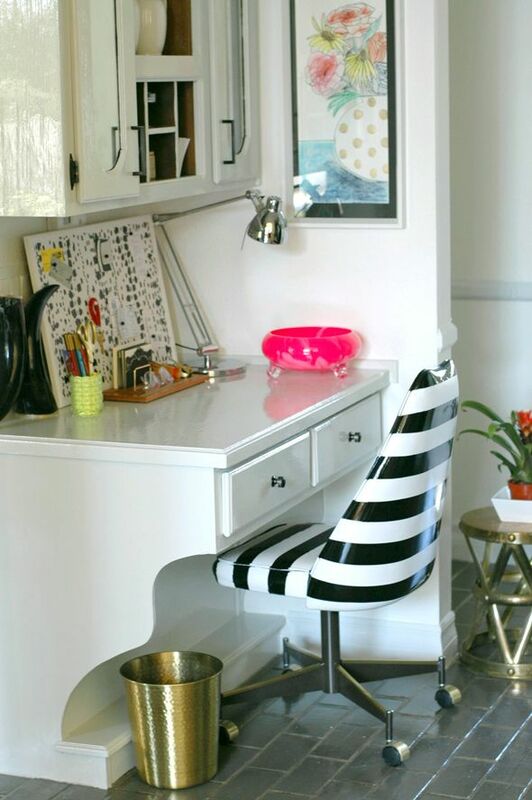 My heart aches for that striped chair! Too bad you can't have both side to side! If there is only room for one then the sparkling for sure--the chair is fabulous! Happy Nesting. love the sparkling! that chair is to die for. 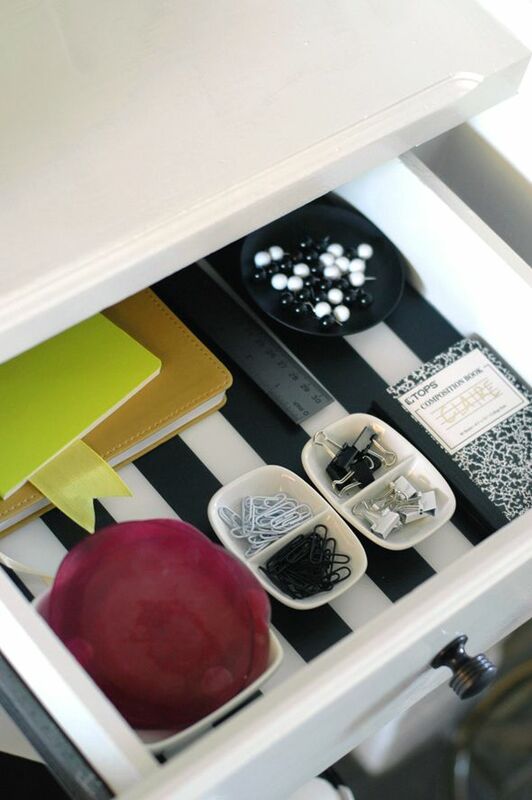 And i love the drawer liners...you never leave out any detail! Team Sparkle! Also... gold scissors?? Where are those from!? still. the other one looks too exhausting...maybe like it is trying too hard. I do tike the still better - but should add that I like the removal of the center doors. Well I have probably the most ridiculous source question: where did you get those white mechanical pencils? They're so cute! Definitely the "Sparkle" one if you want it to be a place of interest (both for you & for your guests), but the "Still" one if you want it to be a more minimal aesthetic point of focus. If it were me, I'd do the "Sparkle," though!